My life in the Sonoran desert in Sun City Grand, Arizona, including nature, travel, art, jewelry, and anything else that strikes my fancy. Last year my son gave me a beautiful Phalaenopsis orchid for Mother's Day. It looked great for a few weeks, but then my "care" was killing it. I was doing all the wrong things. Watering it with an ice cube and failing to re-pot it were my two biggest mistakes. Fortunately I found "Miss Orchid Girl" on YouTube and started following her instructions on how to care for orchids. Her name is Dani, and she is amazing. I bought an orchid pot and orchid medium from Amazon. 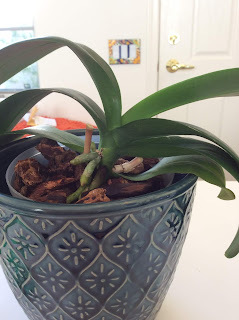 It's two bloom spikes were nearing the end of their life cycle. One had lost all of its blooms and the remaining ones were faded and limp. 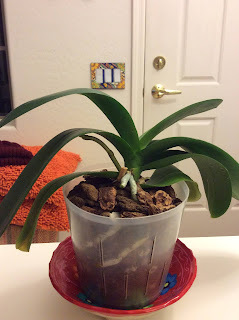 I cut them off and removed the orchid from its original heavy soil. After re-potting the orchid I stopped putting an ice cube a day on it and began to water it properly. The leaves, which had shriveled up, began to fill out and look beautiful once again. It took weeks and weeks for this to happen so I had to learn to be patient. The orchid in September 2018. New roots were appearing and the leaves were looking a lot better. In December a bloom spike starting growing! Most of the time my orchid sits on the edge of my art table. It gets light from windows on both sides of the room, but no direct sunlight. I water it by soaking it for 20 minutes, then draining it thoroughly, about once a week. Over the winder when it wasn't blooming it often went longer than a week between watering. I watch the roots and don't water unless they have turned silver grey. It's thriving now on this better care. When it was new it arrived with 2 bloom stalks, but it only has one this year. But I'm thrilled that it's alive and blooming at all. It's all due to Dani's great videos and lessons on how to grow orchids. If you want to know more about orchids, check out "Miss Orchid Girl" on YouTube. You'll soon be growing orchids like a pro. Owls are messengers in many Native American cultures and in fantasy worlds like Harry Potter. Remember the great scene where the owls fly into Hogwarts bringing letters and packages from home? I love that scene! Recently I had a chance to use an owl and a feather in a project. 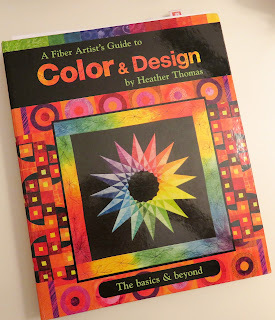 I'm taking a color class based on "Color & Design" by Heather Thomas. It's a beautiful book - full of great color illustrations and valuable info. The class is being taught by Ann Petersen, a world class quilter and member of Grand Stitchers. I'm not a quilter, but I use color all the time in making my jewelry. Taking a class about color has been a great learning experience and a chance to try out new ideas. Every month we are expected to make a new project based on a different aspect of color. 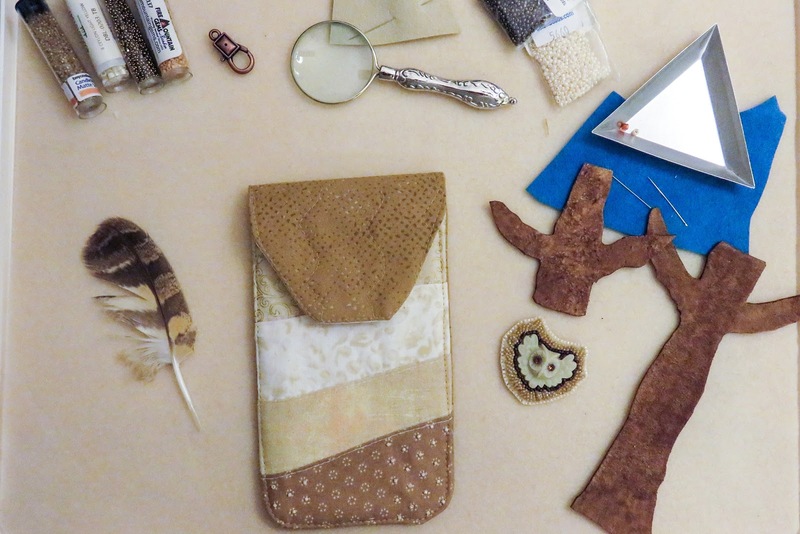 The first project was to create an item using neutrals. Normally I use much brighter colors so this was a challenge. I had a beige acrylic owl face and a feather from a Great Horned Owl as inspiration. 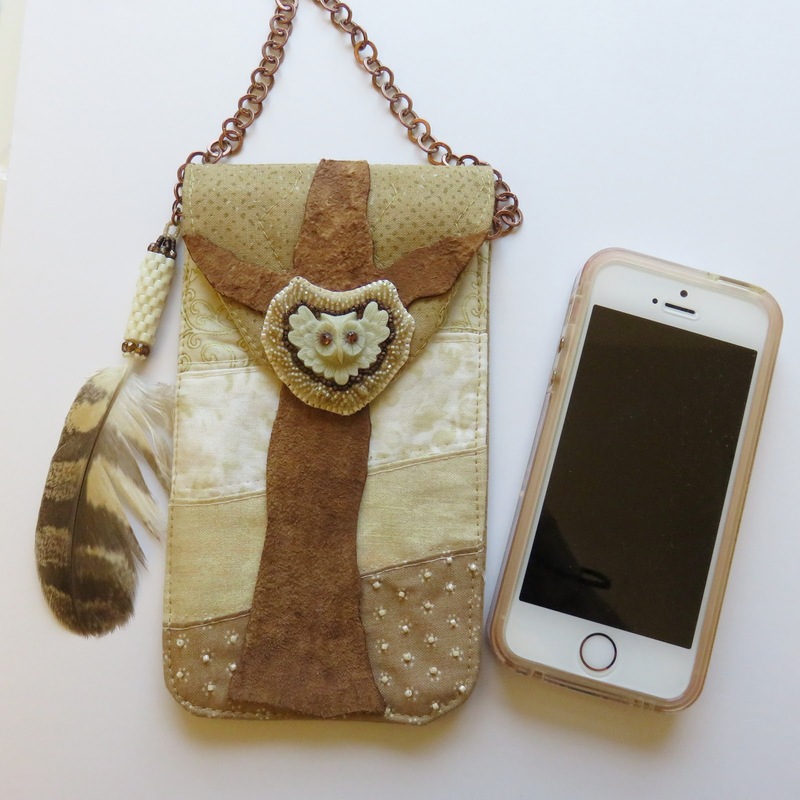 Since owls are messengers, I decided to make a cell phone purse. I've been making Tree of Life jewelry so placing the owl in a tree seemed like a perfect fit. I placed the owl on a feminine Tree of Life to counter the negativity that some tribes associate with owls. Plus I love trees. I used Simplicity pattern #8356 for the purse. I altered the basic pattern to use lots of neutrals for the class requirement. Although I bought 6 or 7 neutrals in a variety of patterns, I ended up using only 5 of them plus leather for the tree. I beaded a peyote tube and glued the owl feather inside it to protect the fragile feather. I added some beads, crystals, and a chain handle to complete the project. If you'd like complete directions on how I made the purse, sign up on the e-mail list or send me a comment with your e-mail address. The directions are free. The pattern and book are available at many places. I bought mine on Amazon Smile so I could support Wild Spirit Wolf Sanctuary with my purchase. 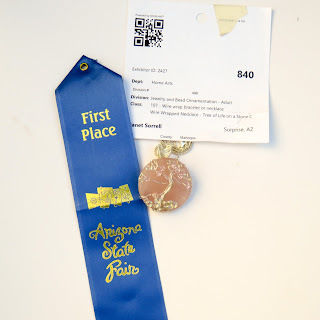 I was really please to be awarded First Place in the Wire Wrapping Class, Adult Division, at the Arizona State Fair this year. I've been making Trees of Life for a few years now, and this was one of my favorites. The tree is on a round piece of Rose Quartz that I bought at the Tucson Gem Show two years ago. It's been in my stash, waiting for just the right project. 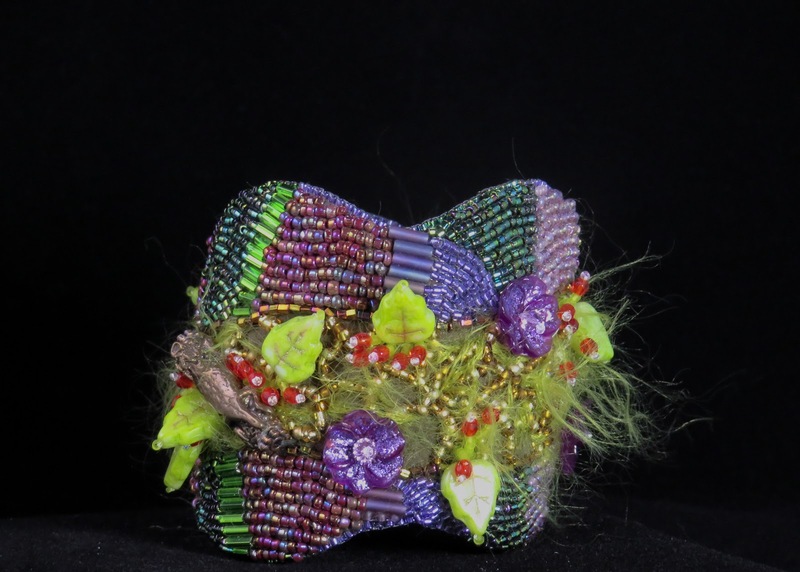 I entered my beaded cuff bracelet, "A Walk in the Woods", in the Fine Arts Division in the 3D Sculpture class. It was accepted into the competition, which was very exciting. This was the first time I had entered a juried contest. It didn't win a ribbon, but I still happy that it got to go to the Fair and be on display for a month. If you have a Fair near you, think about entering one of your creations. You might win a ribbon, too! Even if you don't, you're a winner by entering and displaying your work. It will delight the people who see it and inspire other artists. My cuff is back in my drawer, waiting to be worn on a special night out. The Tree of Life on Rose Quartz is on its way to California. A very nice woman bought it from my Etsy shop. I hope it brings her as much happiness as it did me. 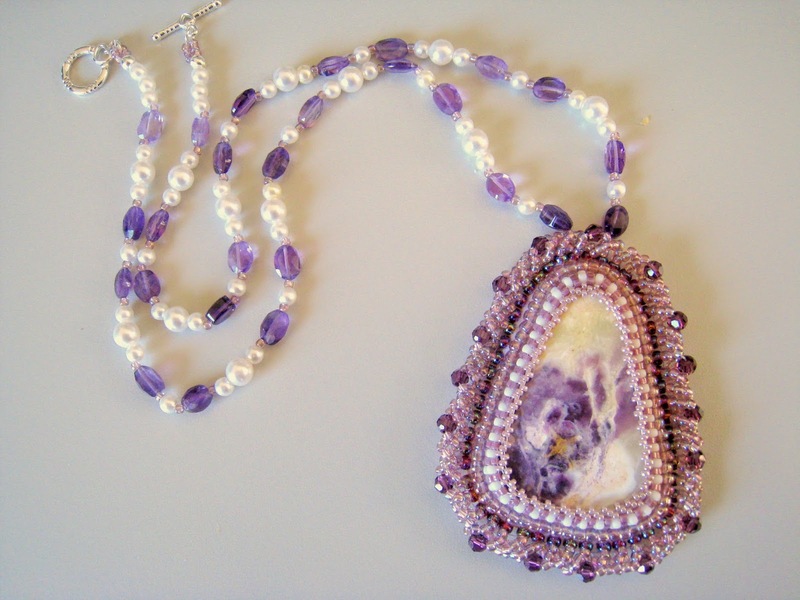 Last July I had the opportunity to travel to Colorado and take a private workshop with my favorite bead artist, Heidi Kummli. She's the author of "The Spirit of Bead Embroidery", my favorite beading book. I practically sleep with it under my pillow. I brought the white bone carving that I had bought at the Tucson bead show earlier in the year. I told Heidi I wanted to make a beaded collar. I had never attempted such a big project, although I have been wanting to make one for a long time. Heidi showed me how to make the collar pattern and helped with the initial design. On a large piece of grey ultra suede Heidi drew the outline of what would morph into the pattern you see in the picture. She attached the middle row using my bone carving and the green and violet beads that came from her stash. While she worked on her own jewelry project, I began stitched her iris gold seed beads around the first three beads. Surrounded by Heidi's art pieces and supplies, I had a relaxing and inspiring afternoon of beading. Heidi was generous with her advice and encouragement and is an excellent teacher. The basic design stayed the same, although I decided to add more natural stones to the project. From an online store I bought more "Heidi beads", the iris gold 10/0 seed beads that she uses in many of her projects. Whenever I worked on the collar I remembered the great time I had that day. If you want to see more of her work, here is the link to her website. She also sells on Etsy in her shop. 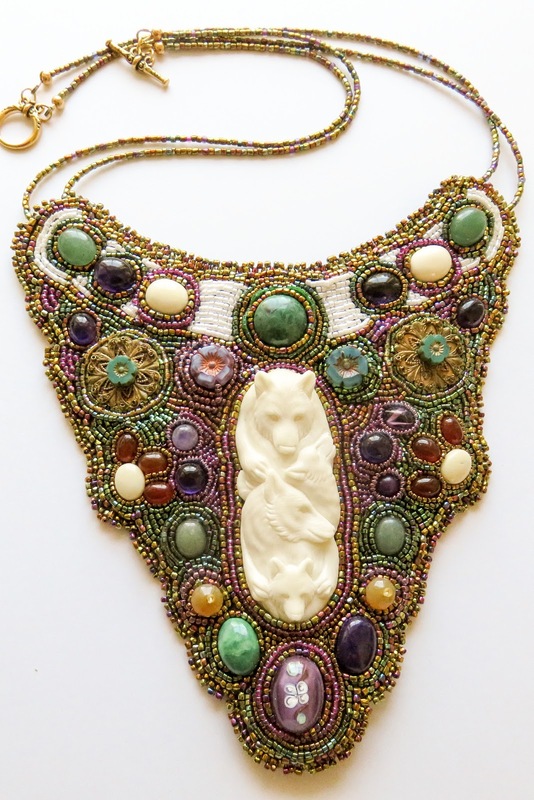 Her designs are one of a kind, wearable art. Beautiful and inspiring. If you have a favorite bead artist who offers workshops or classes, I highly recommend you try to go. I hope you'll have as much fun and get as inspired as I did. I've worn my "Heidi necklace" once and can't wait to wear it again. Etsy is celebrating its 13th birthday by featuring a site-wide sale event! The celebration will be held June 18 to 22, 2018. Many shops, including mine, will feature deals and discounts that you won't want to miss. Etsy is the premier site to find unique handcrafted and vintage items. For the DIY'ers, there are shops selling supplies, too. Currently there are nearly 2 MILLION sellers from around the world on Etsy. You can find one-of-a-kind jewelry like I make, as well as paintings, posters, clothing, knits and much, much more. If there’s something you want, you can probably find an Etsy shop that sells it. Many sellers, like myself, are joining in the birthday fun by placing items on sale. I rarely have sales in my shop, so this is a unique opportunity for buyers to get a handcrafted bracelet or necklace at a special low price. I will be giving a 15% discount on all items over $20.00. Plus free shipping within the U.S.
Click on the Etsy logo on the side or here to go to my shop, Desert Dabbler. Or go to www.Etsy.com to reach their main page. Mark your calendar - the sale starts June 18. 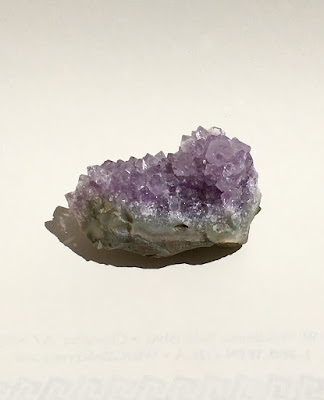 Amethyst is one of my favorite stones. The rich purple color reminds me of royalty. Maybe its the purple velvet robes I remember the movie kings and queens wearing. The ones with the ermine collars and sparking diamonds. They must have cost a fortune. Luckily for me, amethyst rocks are plentiful and available to everyone, even a commoner like me. Cabs, beads, crystals--amethyst comes in many shapes and forms. The rock itself is found in many parts of the world, including the U.S., Canada, Brazil, India and Siberia. It's a type of quartz that gets its purple color from ferric iron. The color ranges from pale violet to deep, dark purple. Quartz dominates in the cabochon pictured here. We found the slab at the Tucson Gem and Mineral show a few years ago, and Kent cut it into a cab for me. I love its abstract shape, which reminds me of a flower. 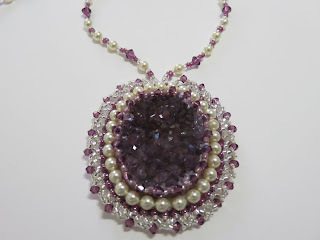 I paired it with Swarovski crystals and pearls to turn it into one of my favorite necklaces. I have a couple of amethyst geodes in my casita studio, too. The one pictured below is the largest I have, although it's fairly small as geodes go. About 5 inches long. At the Tucson gem show I saw Amethyst geodes that were three and four feet tall. Beautiful! At this year's Pueblo show in Tucson I found geode cabochons. My picture doesn't show its full beauty. The crystals are stunning! It measures about 2" square. I added Swarovski crystals and pearls, seed beads, and a lot of love. The result was this Amethyst crystal geode necklace. If you want to see more pictures of it, check out my Etsy shop listing for it here. 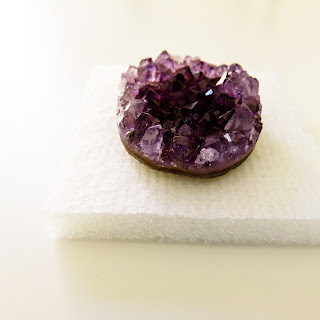 Amethyst has been a favorite of jewelry artists for centuries. In ancient times they believed it would keep a person from becoming intoxicated. In addition to wearing the stone, it was used to make wine goblets. No wonder Amethyst is such a popular stone! I've been a supporter of Wild Spirit Wolf Sanctuary for a couple of years now. Ever since I learned about the work they do in rescuing wolves and wolf-dogs (plus a few other animals) from owners who have abused, neglected or mistreated them. I was even lucky enough in May, 2016, to visit the sanctuary and see Teton, the wolf I help sponsor, and meet some of the other wolves up close. A few weeks ago I received an e-mail from WSWS that included an e-book about wolves and dogs and information about their plans for a Winter Campaign. A few days later I received a second e-mail, and today I received the best and last one about their new campaign. Included in today's e-mail were sound tracks of the wolves and a video! If you love wolves and are looking for a great way to help support them, take a look at Wild Spirit Wolf Sanctuary's video. If you would like to donate, their website is here. Howls of love and gratitude to you! A look at life in the Sonoran desert at Sun City Grand, Surprise, Arizona. Welcome to Desert Dabbler! I live in Sun City Grand in Surprise, Arizona, with my husband, Kent. I love wildlife, beading, and traveling. Combing these passions is my main activity at the moment. You can see my beadwork in my Etsy shop. My profile picture is a mascot of the southwest, the coyote. We see them as they wander through the neighborhood, chasing rabbits and drinking from the water features. No retirement for them!